I created this image immediately after the bride had gotten dressed on her wedding day. I noticed the crucifix on the wall above the dresser and was inspired to create a photograph depicting the bride praying quietly before her wedding ceremony. 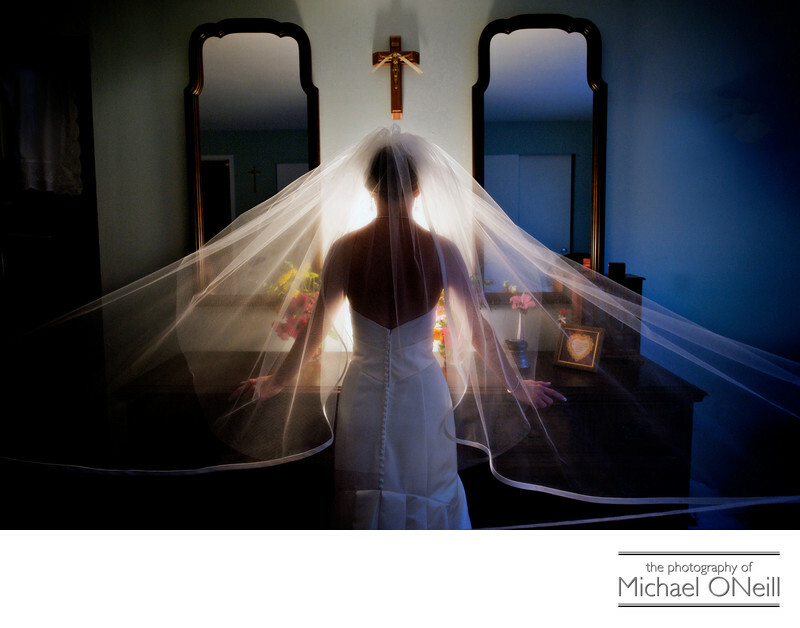 I set up a portable video light on the dresser between the mirrors to create a halo-like glow around the bride. I then had my assistant and the maid of honor fan out the bride’s cathedral length veil to either side of her. I try to come up with fresh, new ideas in my wedding photography. For generations wedding photographers have been taking pictures of brides in front of mirrors. This is simply a creative new twist on a timeless wedding theme. My wedding photography has been described as "...The Perfect Blend of Traditional Elegance and Contemporary Styling...". and capturing this image is the perfect example of that quote in practice. Later in the day this bride would be having a lot of fun with her groom and their bridal party, taking fun wedding photographs on the sand of Cedar Beach in Miller Place, New York. You will find some of these shots right here on this web site. This couple and their bridal attendants were some of the most fun people I’ve ever photographed. After our session on the beach the happy couple hosted their amazing wedding reception at The Hamlet Willow Creek in Mt. Sinai, NY. This image has garnered numerous awards in various professional photography competitions, including a silver award Accolade of Excellence in the WPPI (Wedding and Portrait Photographers International) 16 X 20 print, album and filmmaking competition held annually in Las Vegas, Nevada.